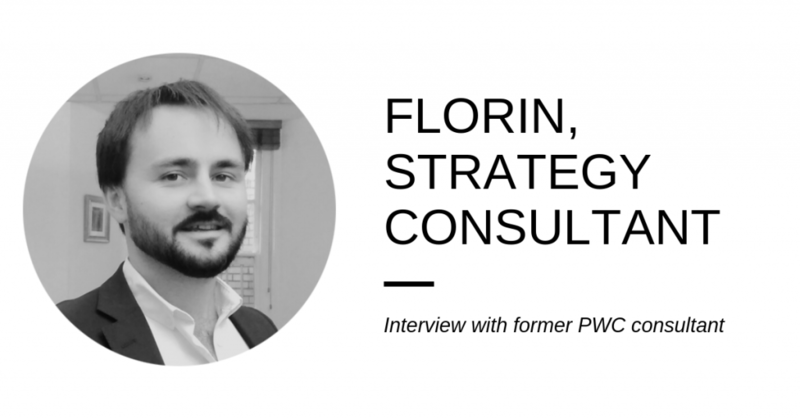 Here’s a guest blog from one of our freelance members – Florin, a former PwC consultant. How long have you been a freelance consultant? and what is your industry focus? My first big contract was in 2014 with Holidog, a French marketplace start-up for pet owners, but that turned into a permanent stint rather after just a couple of weeks. I’d say I have started seeing myself as a full-time independent consultant about a year ago. Since then, I’ve worked with a couple of start-ups (FinTech, PropTech) as well as corporate clients in Banking, Insurance and Telco. I focus on a rather broad space –helping my clients make use of the ever-evolving technology landscape to stay on top of their game, innovate, enter new markets or find a product-market fit for new services. Having been a consultant and a tech entrepreneur, knowing the challenges on both sides, that really helps tailor my proposition and add credibility. A lot of people start freelancing to fill a period of transition. Certainly, that’s what happened with me. I had been a consultant for 5 years, then started working with start-ups during a sabbatical. One of those contracts became a permanent gig which lasted 2.5 years. At the end of it, I found myself wondering: do I go back to consulting? – which I almost did – or do I do my own thing? And eventually, the entrepreneurial spirit prevailed. Doing my own thing is important and my key strength is, in fact, being a consultant – the two came together, a bit like a Venn diagram. What surprised me most is how many ‘established’, large companies use independent consultants even on strategic questions. Having worked with 20-30 major clients before, I can’t recall coming across independents unless it was a project management support role, with very confined attributions. I think the consulting industry is going through a transition period though, and the gig-economy has definitely matured so I can post-rationalise it. It’s still surprising when you find yourself in the middle of it. Well – I did it progressively, following a sabbatical and a long stint with a start-up so I warmed up to it, didn’t jump into the cold water so to speak. Certainly, there are a lot of projects out there and of course, there is movemeon that can really really help take the first steps, but the space is competitive, no question. The most important element long term is the relationships that one builds along the way and of course, the credibility you gain through this network. Other than that, what I didn’t expect or plan for was the cyclicality that even larger consulting firms experience. That becomes even more tangible as an independent consultant. I remember having pushed about 17 full-blown proposals one month which finally resulted in one project. I was drained at the end of that period. Another one of those proposals resulted in the client asking me to do a different project a couple of weeks later so I guess the ratio wasn’t that bad in the end; but even so, that specific time was rather daunting. What followed after was a period when I actually had to turn down work. It may seem like a great problem to have but still needs a well thought-through approach – think of a repeated game in game-theory. That’s definitely a major aspect that I’d underline – to be comfortable with the cyclicality of things. On a different note – I am really happy to have a talk about ups and downs with anyone who has questions. Absolutely, do reach out if you read this. One main pro & one main con of freelance consulting? Ohh, there are a lot of pros. The obvious ones are the flexibility and having the actual choice of really working on projects that one wants to work on. Financially it’s not too bad either. The cons are the uncertainty around what happens at the end of a project – but at least it’s in your own hands. And of course, not having an actual team of analysts help with proposals or critical deadlines. Overall, I think I work much longer hours than I was in any other previous role, but it feels very different. It’s all an investment into myself, so it’s much easier to do the late hours and the weekends. And of course, being occasionally able to ‘pull’ these hours from a beach or a pool is a big plus as well. Would you consider going back to perm? I wouldn’t exclude it completely but certainly not in the short-term. I am enjoying freelancing too much to commit to something full-time even though a role like that may exist somewhere. Maybe I would have given a different answer a couple of months back, but after one year, I’m looking at the whole game differently anyway. I’m not ‘just’ freelancing but building a consulting practice. Through the start-up work, I have access to a very strong network of designers, product managers, data scientists that could help me downstream, after an initial strategy piece. Certainly, that’s where I see this going. It’s very early days though so who knows how it evolves, but ideally, this is my permanent role.